Special commission for a former member of the Welsh Regiment, depicting his interests of bee-keeping, wine-making, gardening and horse riding! 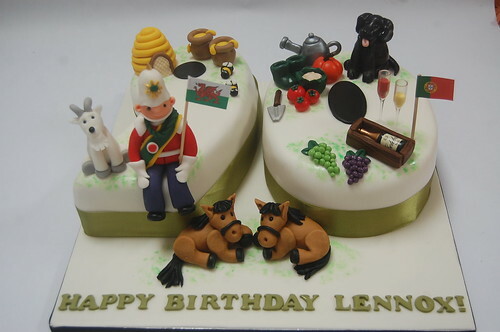 Lennox’s 90th Cake – from £120. Thank you so much for the most wonderful cake you did for my fathers 90th. I was completely overcome when I saw it…You are so clever, imaginative and talented. The cake not only looked amazing but was delicious too… And you were so professional which made the whole design and decision process stress free. Thank you.